Do you feel that there are so many pressing issues in your life that make you feel pressured and always in a state of stress? Do you encounter a person who makes you feel uncomfortable but can not do anything to soothe the discomfort? You meet a problematic boss, despite many efforts but still caught and blamed? Do you want to find a place to relieve the anger that has accumulated throughout the day? What do you do? 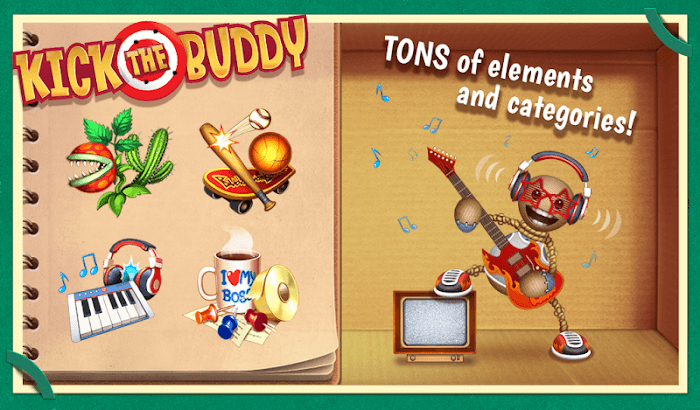 Smash your belongings, drive at high speed, find them out and shout loudly … or simply pick up the phone and download Kick the Buddy to find the cheery and fun, get rid of all sorrow in just a few minutes? 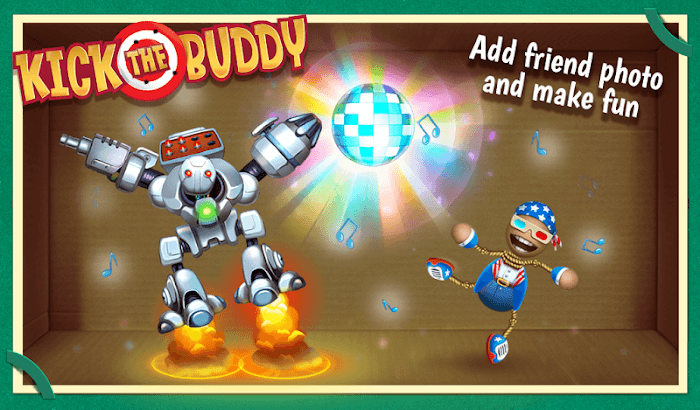 Come to the release of Playgendary and experience the fun of Kick the Buddy! Kick the Buddy MOD is a fairly simple game. At the start of the game, a funny wooden figure appears on your screen. And all you have to do is find ways to injure and ruin the wooden puppet. After successfully destroying the puppet, you will receive some gold and some amount of gold corresponding to the level of damage you have created. After completing each level, you will be promoted. Each time you level up, you get a lot of cool new things to explore. For example, the store will open up new items and weapons so you can enjoy the many unique and exotic tortures. So what is cash used for? That money is useful after the brutal “torture”; you can comfort the little soul of the puppet by buying him nice clothes. For example, the basketball players, robots, playful prints like a star, superhero or clown … But no matter how cute and beautiful the clothes are. When you enter the game, you will continue to “torture” it to release stress and make more money … buy new things for it. I wonder why must buy items when we then destroy it? Or does the publisher merely want to be able to wear a lot of cool clothes to ease the boredom and monotony when faced with a wooden puppet forever with only one type of clothing? This is a highlight of the publisher Chill Fleet when the game looks quite monotonous, but the graphics are incredibly eye-catching. Although it’s a pretty violent game, the colors use bright colors, warm colors and a warm, cheerful feel rather than the scary scent of a torture chamber. Wooden stick puppet is hilarious, so even though everyone is trying to make it head first place a path, but no one can deny the lovely formation that makes them more fun. Pieces of equipment and clothing of puppets in the shop are also a creative publisher with a lot of unique designs and types. Only the torture you can not imagine, but Kick Buddy’s shop cannot be missing. Kick the Buddy is an exciting game for those in need who need a break in life. 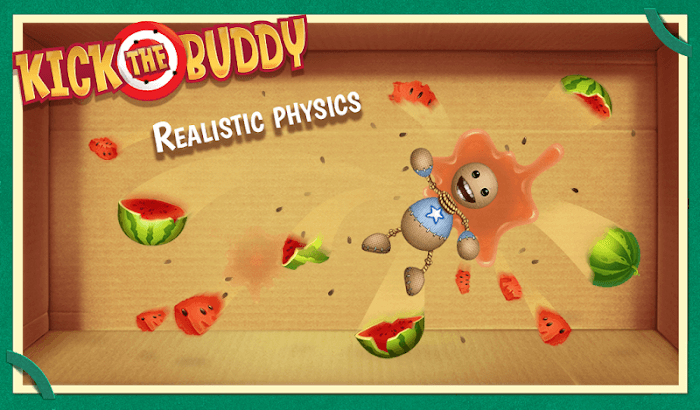 By trying to ruin the humanoid wooden figure, the game promises to give you an enjoyable and funny experience. With animated cartoon graphics and hot and bright colors, you will not feel this is a real “torture” room. However, with some of these violent elements, the game is not so suitable for young children, so parents should consider before downloading games when they are under age to recognize the difference between the game. Actual off. But for those who are in need of a place to relieve pressure or exasperation, Kick the Buddy is an excellent choice. 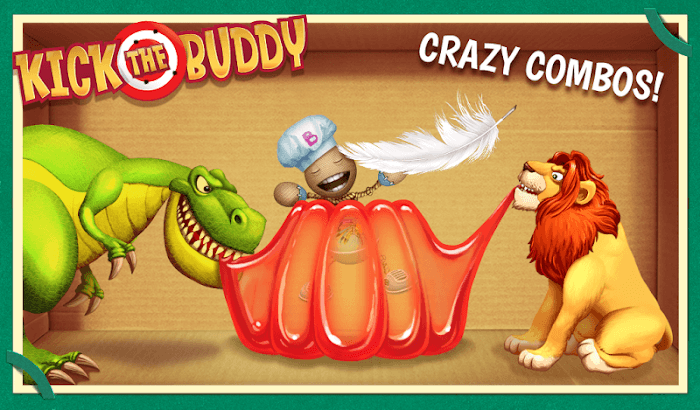 Get your hands on and download Kick the Buddy!